Heads Up is a reposting of AACBWI’s announcement of book releases that may peak the interest of young African American readers. As a Brown Bookshelf partner, The African American Children’s Book Writers & Illustrators society is dedicated to spreading the word about these and other books that are of special interest to multi-cultural audiences. From Board Books to Young Adult fiction, Heads Up serves as a guide of what to look for in stores or what to ask for at the library. 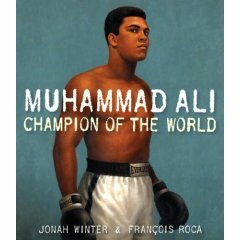 In keeping with the “theme” of historical books leading to Black History Month, this week’s releases are all biographical. 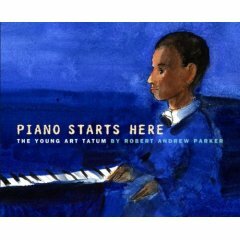 Regardless of whether they’ve heard of jazz or Art Tatum, young readers will appreciate how Parker uses simple, lyrical storytelling and colorful and energetic ink-and-wash illustrations to show the world as young Art Tatum might have seen it. Tatum came from modest beginnings and was nearly blind, but his passion for the piano and his acute memory for any sound that he heard drove him to become a virtuoso who was revered by both classical and jazz pianists alike. Clay let everyone know that he was the greatest boxer in the world. He converted to the Nation of Islam, refused to be drafted into a war in which he didn’t believe, and boxed his way back to the top after being stripped of his title. The man that came to be known as Muhammad Ali was heard in a voice no one will ever forget. Nelson Mandela comes to life in this portrait of a diplomatic man whose commitment to freedom gained him both the Nobel Peace Prize and Time’s Man of the Year honor. The son of a Thembu chief in South Africa , Mandela began his life-long campaign against white colonial rule while a college student. 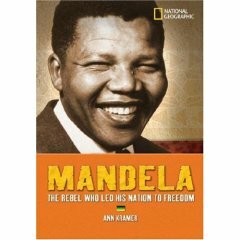 Kramer’s eloquent, yet approachable text describes the leader’s dedication to nonviolence, his role in the African National Congress and his arrest in 1962 for sabotage and conspiracy. During his 27 years in prison, Mandela continued his fight for a democratic and free society, and ultimately was released and elected president of South Africa . I love this time of year when African American books get the spotlight. Its only two months but hell I’ll take it. (Its better then two weeks) I am happy to say the store I work at carries all three of these books. Last week I was working in children’s non fiction, I squealed and said SHUT UP with delight way too many times but I couldn’t help myself , kept running across books that made me happy. First I saw Onward a photobiography of Polar Explorer Matthew Henson by Dolores Johnson. Then I saw I, Matthew Henson by Carole Boston Weatherford , then I noticed Piano Starts Here by Robert A Parker, having that one in stock totally blew me away because Art Tatum is not a well known jazz artist, and I suppose thats why bios are written. Hopefully The Brown Bookshelf can help keep that spotlight going more than 30 days a year. That’s the plan anyway. So glad to hear your store carried them. I was at a B&N in a predominately Af-Am area today and they didn’t have quite a few of the books I was seeking. It was disappointing. Doret, thanks for your words. The Brown Bookshelf really does hope we can expand the focus on Af Am books beyond a dash of January and all of February.